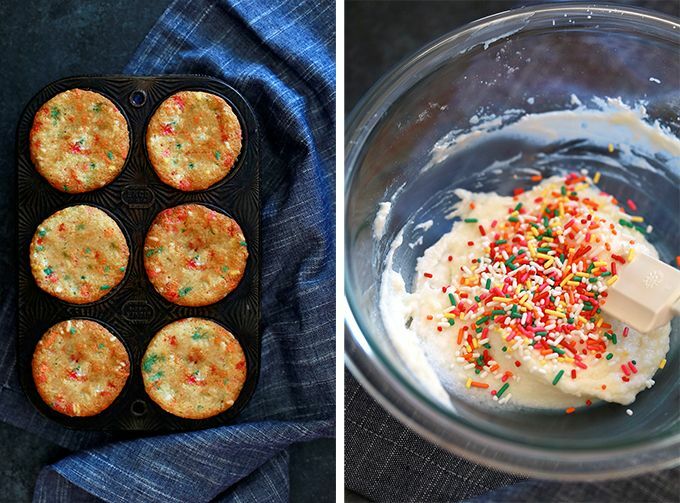 These Small Batch Funfetti Cupcakes are simple, delicious and ready in just 30 minutes. Studded with rainbow sprinkles and topped with funfetti buttercream frosting, this recipe makes six cupcakes. Can I be honest for a second? I hate making cupcakes. Hate. Despise. Granted they're absolutely delicious, but they're just so much work! 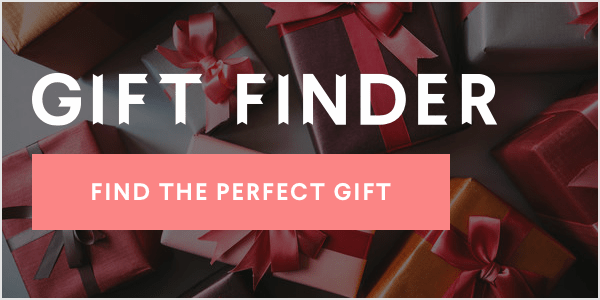 With birthday season right around the corner for our family – three birthdays within 10 days! – we have lots of cake in our future. Enter an easy shortcut. 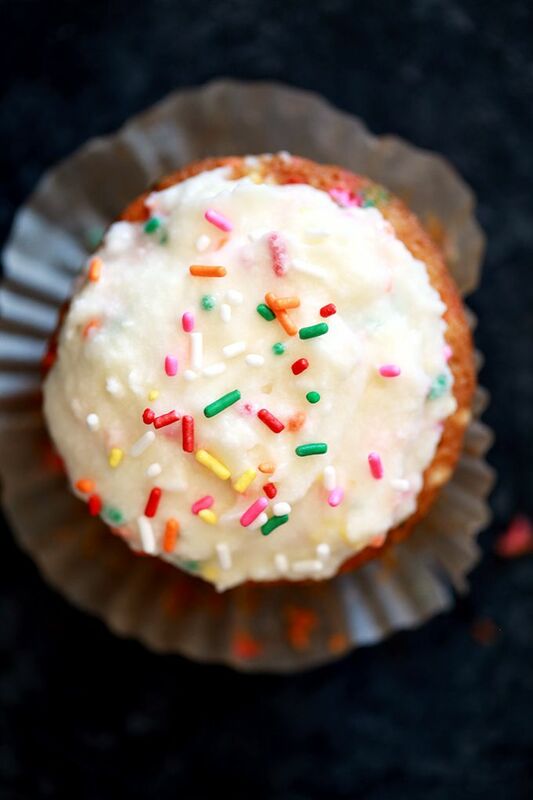 A Small Batch Funfetti Cake recipe that makes just six cupcakes. Considering I have yet to meet anyone that doesn't love sprinkles laden cake AND the fact that our family has six people in it, this recipe is what I'd like to call perfect! Small batch is typically not my jam. The more sweets the better, I say! Especially with a large family. But a small batch of cupcakes I can totally get behind. Thanks to my friend Christina Lane, the Dessert for Two queen, I was able to make six delicious cupcakes in just 30 minutes. My four children thought I was amazing as they didn't have to wait long for the cupcakes I bribed them to finish their chores with. All thanks to Christina's aptly titled third book, Sweet & Simple. There are so many gems held between the two covers of this book and all of the recipes are divided by the type of pan needed. Genius! Her Small Carrot Cake with Caramel Cream Cheese Frosting is begging for me to try it next. Another positive in the Small Batch Funfetti Cupcakes column? I didn't need an entire jar of sprinkles to create these beauties. In fact, when I pulled out my baking drawer I noticed I was running quite low on rainbow sprinkles but was pleasantly surprised that I had just enough – four tablespoons, exactly! – to continue my baking project as planned. Actually that's one tablespoon more of sprinkles than Christina's recipe calls for and that's just because I just had to double the frosting. I'm a frosting fiend! Sure you get fancy and pipe the frosting with a decorative tip, but really, the recipients of these cupcakes could care less about piped frosting and instead are only interested in the sprinkles to frosting ratio – there better be a lot of sprinkles! – and how quickly they can eat the cupcake set before them. 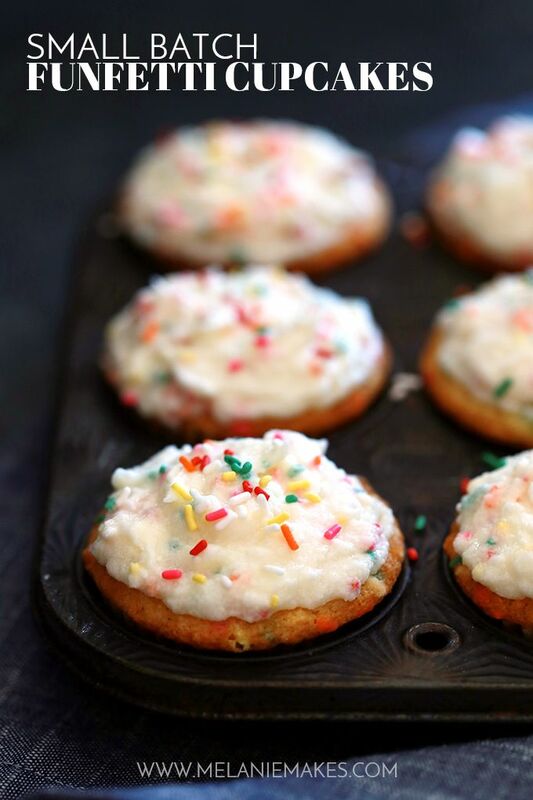 These Small Batch Funfetti Cupcakes are simple, delicious and ready in just 30 minutes. Studded with sprinkles and topped with funfetti buttercream frosting, this recipe makes six cupcakes. -In a medium bowl, stir together butter and sugar. -Add egg white and vanilla and stir until well combined. -Add flour, baking powder, baking soda and salt and stir together while slowly adding milk. -Add sprinkles and stir until just combined. -Using a large cookie scoop, add batter to muffin tin lined with six paper liners. -Bake for 15-17 minutes or until toothpick inserted into center of cupcake removes cleanly. -In a medium bowl, beat together butter and powdered sugar using a hand mixer. If necessary, add milk to help frosting come together. 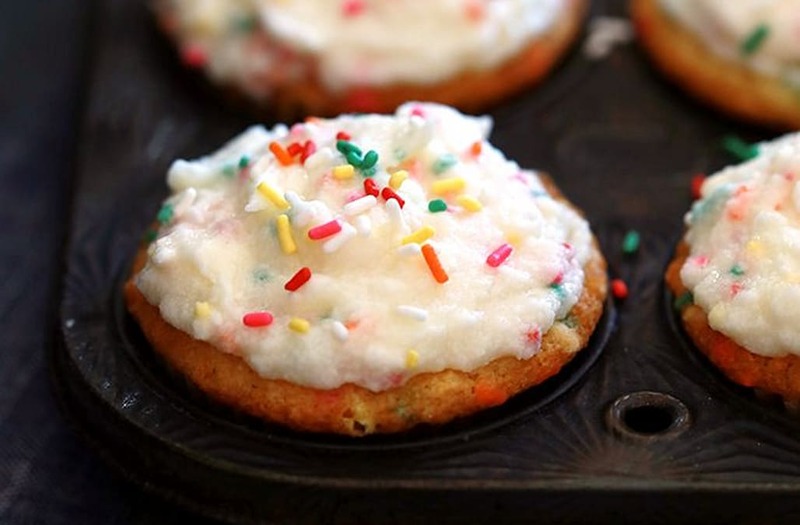 -Stir in sprinkles immediately before frosting cupcakes. -Garnish cupcakes with additional sprinkles just prior to serving. The post Small Batch Funfetti Cupcakes appeared first on Melanie Makes.